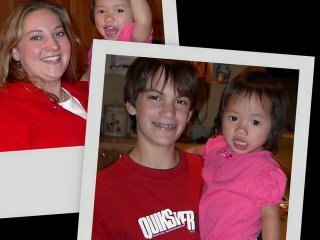 This is one of my boss's son's and their new daughter they adopted from China. She just turned two and she is an absolute doll. My boss has three sons and they wanted a little girl. She is finally warming up to me and letting me hold her and give her kisses! I am so happy to know their family and work for such a wonderful doctor. What doctor...Their son in the pic looks familiar! By the way what a cute little girl!! !